Four-hundred and sixty-three years ago today, Martin Luther nailed his 95 theses to the castle church door in Wittenberg. That event has long been recognized as the symbolic beginning of the Reformation, and so we celebrate today as Reformation Day. In honour of the festival, I thought I’d share the following documentary entitled “Martin Luther: The Reluctant Revolutionary.” Enjoy! Grace alone! Faith alone! Scripture alone! Today was the first snowfall of the winter in Regina. We’ve had about ten cms of snow, coupled with bitter winds of 70 km/h. The precise meteorological term for what we’ve “enjoyed” today is “weather bomb.” All in all, a somewhat miserable day in the Queen City. And the snow just keeps falling and the winds just keep howling. Still, the fact that it is the first snowfall of the winter reminds me of one of my favourite poems: “St. Agnes’ Eve” by Alfred, Lord Tennyson. I cannot help but recall his line about the “first snowdrop of the year,” even if the winter day Tennyson depicts is far more idyllic than the one which visited Regina today. Yet perhaps the contrast between Tennyson’s snowdrop and ours serves to make his words all the more beautiful. Our dreary day makes his seem all the more heavenly. And, indeed, perhaps the heaven to which Tennyson points in this poem is made all the more beautiful by our current annoyances, as we anticipate that celestial paradise where such annoyances will finally pass away. As Tennyson himself demonstrates in the poem, recognition of the imperfectness of this world can be the impetus for greater hope in the state of perfection to come. May my soul follow soon! That in my bosom lies. To that I hope to be. In raiment white and clean. To make me pure of sin. The bridegroom with his bride! We cannot explore the relevance of theology, however, without first noting how bad a reputation it has developed within the churches in the last few decades. For some Christian leaders, theology is irrelevant to real life. It is about retreating into ivory towers when there are more pressing things to worry about. Yet rightly understood, theology is about enabling informed Christian action. It makes us want to do things, and do them in a Christian way. It helps us make judgements about how best to act; it encourages us to engage with the real world. The book’s arrival is timely. All around us, Christians, churches and even entire denominations are stepping away from theological orthodoxy, chasing after personal convictions and ideologies contrary to God’s revealed Word. In the midst of all this, McGrath points us back to the importance of a theologically firm faith; a relationship with God that develops through the applications of our minds. Along the way, he reminds us that this same theological reflection not only strengthens our individual faith and relationship with God; it further prepares us to be witnesses to the world around us. It gives us a new perspective when approaching the major issues prevalent in Western culture. The book is certainly worth a read. In particular, Part I (the first six chapters) are truly insightful. It draws on theological inspiration from such figures as George Herbert, Martin Luther and C.S. Lewis while exploring such diverse subjects as the transformative vision granted by the Gospel, the cross as the anchor in times of despair, and the place of apologetics in the Christian’s life. 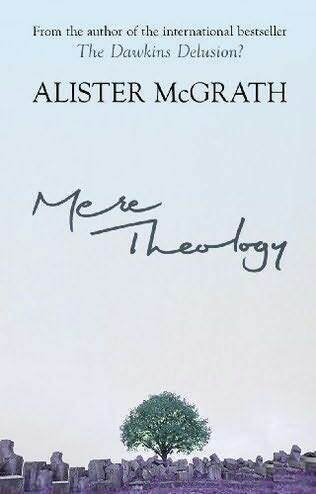 The second part, exploring the relationship between faith and science (McGrath’s own area of expertise), admittedly feels a little disjointed from the first half (except as an example of how faith transforms our understanding of reality). No doubt the occasional disjointedness results from the fact that book is “based on previously unpublished lectures and addresses, given over a two year period.” In truth, the book would likely be better if the Second Part was published separately from the first, as it doesn’t really relate to “mere theology” in the way that the First Part does. I heartily recommend this work to my readers. Most certainly you will not agree with everything McGrath writes. I know I don’t. But then, if we take McGrath’s call to theological scrutinity seriously, it would be wrong to take everything he says at face value. We must be discerning readers. And that, I think, is something we can all agree on. Captain Thin is powered by	WordPress 5.0.4 and delivered to you in 0.350 seconds using 31 queries.